VeriFone is a major designer and manufacturer of electronic payment solutions. The brand serves financial, healthcare, hospitality, government, petroleum and retail industries around the world. Their products include point-of-sale devices as well as supplies required for them. They are committed to advance in cutting-edge technologies. PrinterStock.com’s VeriFone printer ribbon products and impact printer ribbons for VeriFone are designed to be uncomplicated and to provide reliable performance. VeriFone ribbons are plastic wrapped separately to safeguard the ink from drying out and ensure consistent, high-quality saturation. Our compatible Epson ERC-31 is compliant with the VeriFone 930 R and the VeriFone Ruby Supersystem. VeriFone ERC-31 is a purple printer ribbon that is packaged 6 to a box. These cartridges give top quality results and exceed OEM standards. 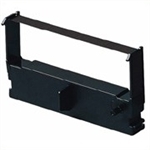 If you have a question about using one or our VeriFone ribbon cartridges, contact us at 1-866-748-8273.